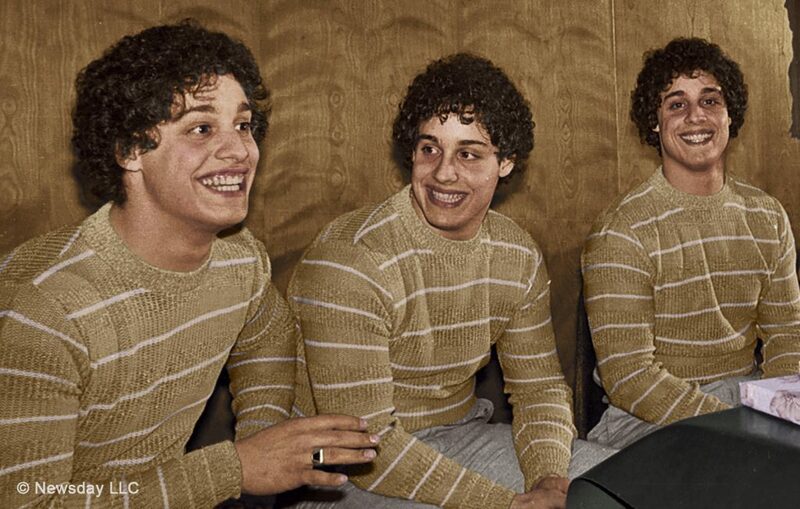 Three Identical Strangers/Photo courtesy of New Cinema Ltd.
Do you ever have that dream where you’re walking down the street and you suddenly come face to face with someone who is your exact double? Now imagine that happening in real life, only times three. Tim Wardle’s riveting documentary Three Identical Strangers describes the experiences of Bobby Shafran, Eddy Galland, and David Kellman, triplets who met for the first time at age 19. Theirs is an amazing story and director Wardle takes the viewer through the twists and turns of the narrative from the perspective of the protagonists, generating suspense and raising provocative issues as the tale unfolds. The documentary opens with a close up on Bobby Shafran recalling his first day at college and the bizarre feeling of walking on campus and being greeted by strangers who behaved as if they were old friends. Articulate and charismatic, Shafran draws one into the story, which is interspersed with dramatic reenactments showing a young Bobby from the back, so that it feels as though it is all happening in the moment. If at first, he may have thought that he just happened upon an unusually friendly campus, when a guy appears at Bobby’s dorm room and calls him Eddy, it is clear that something odd is going on. A second narrator/interviewee, David Kellman, with the same appealing features as Shafran, enters the narrative, conveying events from his perspective. As they learned, Bobby Shafran, Eddy Galland and David Kellman were adopted by different families at age 6 months, and grew up without knowing of one another’s existence. Discovering one another was a huge surprise and great joy for all three, as reflected in photographs from that time. The unusual circumstances of the brothers’ reunion prompted a media circus, they were much in demand for interviews and television talk shows. The abundant documentation from that time is augmented by interviews with family and friends, as well as the two main narrators Bobby Shafran and David Kellman. It’s an amazing story, yet the most compelling aspect of the narrative is yet to come. As the documentary unfolds, questions arise, the narrative twists and turns darker. In depth research, fascinating interviews, tight script, and clever editing make this documentary as suspenseful as a feature thriller. This is the stuff nightmares are made of. Much has been written about the documentary (a feature version of the triplets’ story is in the works), but it is such a well-made film that I prefer to avoid spoilers. One of the film’s central themes is the issue of nature vs. nurture as the primary shaper of character and destiny, offering thought-provoking insights as one follows the triplets and their story. Director: Tim Wardle; Cinematography: Tim Cragg; Editor: Michael Harte.